Artificial intelligence (AI) is changing everything—fundamentally reconfiguring industries, professions, and lives—and enjoying high-profile success stories with everything from autonomous vehicles to consumer electronics. Increasingly ingrained in the business world, AI represents profound change for enterprises. Early adopters are demonstrating high-impact business outcomes in fraud detection, manufacturing performance optimization, preventative maintenance and recommendation engines. You’ll explore several case studies, including how a major bank successfully used a variety of deep learning methods to fight financial crime. Large enterprises need a partner who has done it before. 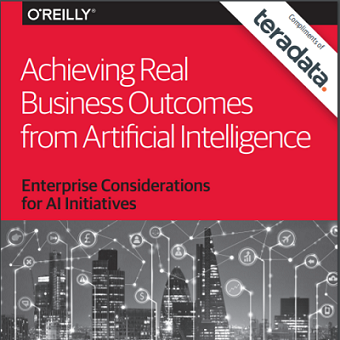 Teradata has successfully implemented AI across multiple industries, proving the technology as well as producing material business outcomes. Teradata continues to channel IP from successful, field-based AI client engagements into accelerators that lead to faster time to value and reduce the risk of custom AI initiatives. Teradata brings to life artificial intelligence solutions that drive business outcomes by combining proven world-class deep learning expertise gained with leading clients, unique industry understanding, and proven IP, accelerators, and services. Danske Bank applied innovative analytic techniques, including artificial intelligence, to better identify fraud while reducing false positives. To take advantage of AI and drive business outcomes, you’ve got to know how it applies to you and how you can take advantage of it. Teradata knows how to most effectively apply AI to a wide range of enterprise use cases such as fraud reduction, recommendation engines, preventative maintenance and yield optimization. AI is inspiring the entire Danske Bank team while driving business outcomes and delivering dramatic results. The AI revolution is here. Let's get started.